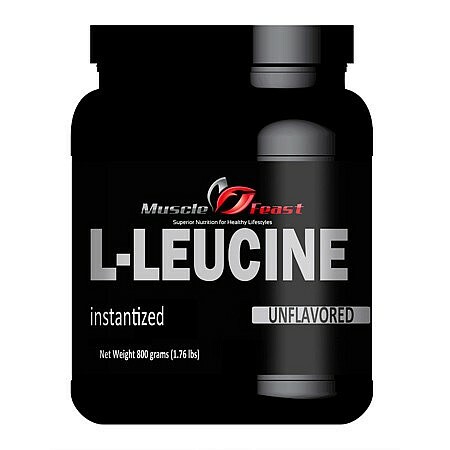 What is L-Leucine? (abbreviated as Leu or L), L-Leucine is an α-amino acid with the chemical formula HO2CCH(NH2)CH2CH(CH3)2. It is an essential amino acid, which means that humans cannot make it within their body. So for the body to get this key amino acid in the system it has to pull them from a variety of foods. Its codons are UUA, UUG, CUU, CUC, CUA, and CUG. With a hydrocarbon side chain, leucine is classified as a hydrophobic amino acid. It has an isobutyl R group. Leucine is a major component of the sub units in ferritin, astacin and other ‘buffer’ proteins. Food sources for leucine are: meat, nuts, beans, brown rice, soy flour, whole wheat and eggs. Leucine contributes to regulation of blood-sugar levels; growth and repair of muscle and bone tissue; growth hormone production; and wound healing. Leucine also prevents breakdown of muscle proteins after trauma or severe stress and may be beneficial for individuals with phenylketonuria. It is also one of the three Branched Chain Amino Acids and works in conjunction with both valine and isoleucine. Recent research suggests that higher levels of leucine with valine and isoleucine product better results and not only contributes to regularing insulin levels but can also reverse type 2 diabetes and contribute to weight loss. According to the study in the previous link, Leucine has also been shown to reduce LDL Cholesterol by 27%. Recommended dose: The proper dosage depends on a variety of factors – body weight, activity level, lifestyle stress, overall health, and diet. There are no established daily recommendations for this supplement. As a dietary supplement take 25 – 65 milligrams per pound of bodyweight per day. It is recommended that supplemental leucine be used in union with both isoleucine and valine. Mix into water or your favorite beverage 1-2 times daily or as directed by your physician. Mix for 20-30 seconds using a shaker cup or mix thoroughly with a spoon. May not mix very easily. May be hygroscopic and may clump during shipment. This does not affect the efficacy of the product; just the texture. Try mixing in sport drink or anything with a ph less than water to improve mixability. It may be necessary to let it sit for awhile. Leucine supplements taken even in somewhat high amounts can produce physical symptoms similar to those seen during hypoglycemia in the body. Leucine supplements taken at exceedingly high levels can induce more ammonia accumulation in the body and might result in pellagra in the person. If you have liver or kidney disease, you should not take in high doses of amino acids without asking your doctor. It is crucial that you always speak to a knowledgeable healthcare provider before taking any dietary supplements. This advice is also recommended for anyone suffering from a health condition.